Dutchmen Kodiak travel trailers are offered in 3 different models and a range of floorplans that are intended to appeal to a wide range of RVers. Don’t let the word “express” trick you. The Kodiak Express features custom cabinetry that increase storage space by 40% thanks to their wider, deeper, and taller designs. 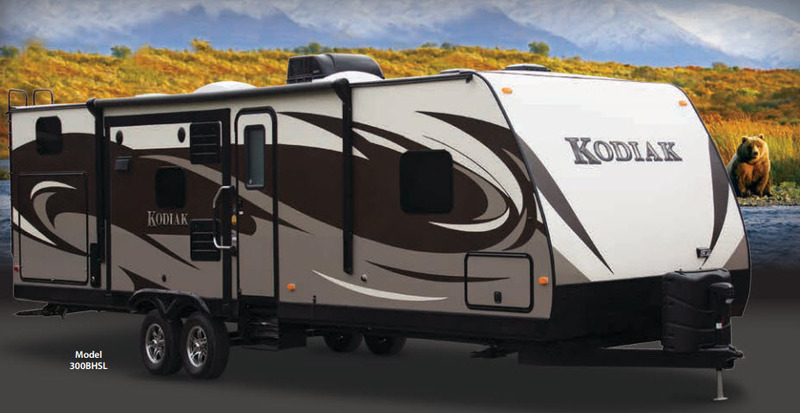 The Kodiak Ultimate is a lightweight model that allows RVers to tow is using trucks and SUVs. Kodiak Expandables allows you to enjoy the stability and comfort of travel trailers, without losing the ambiance of tent camping. 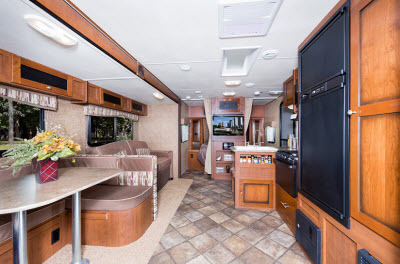 Several great floorplans are available to RVers. This floorplan can sleep up to 5 people and measure 31′ in length. At the front of this floorplan is a queen sized bed with two wardrobes and overhead storage. 1 large slide comes with a sofa and an oversized U-shaped dinette. Against the back wall, you’ll find two comfortable chairs, while the kitchen includes a skylight and pantry. In the bathroom is a linen closet, one example of the massive storage provided to RVers. The 276BHSL can sleep up to 8 people, making it a great choice for large families. The rear sleeping area includes bunks that measure 52×74″ and a wardrobe. Adjacent to the rear sleeping area is the bathroom, which includes an entrance to the outside of the RV. One slide in the kitchen includes the refrigerator and range, while situated across from this slide is another one that features a 40×74″ dinette and standard sofa. You can also find a queen sized bed at the front of the RV and an entertainment center on the wall that separates the living area from the bedroom. Made for army sized families, this floorplan can sleep 11 people and measures 32′ in length. An outside kitchen allows you to entertain and enjoy meals outside, while the rear comes with a bunk over a children’s dinette and an additional double bunk with a twin bunk overhead. The slide includes an oversized U-shaped dinette and Jack Knife sofa. If you’ve got a large family or plan to accommodate many guests, this is the travel trailer you’ll need. Are you looking for a lightweight, affordable, and comfortable travel trailer? Contact us to learn more about the Dutchmen Kodiak or stop by to walk through our available units. We can answer your questions and our friendly staff will make sure you’ve got the information needed to make a smart decision.